Claude-Henri Saint-Simon, the son of a minor noble, was born in Paris, France, in 1760. Privately educated he served in the French Army during the American War of Independence. Afterwards he travelled to Mexico and Spain where he became involved in several canal projects. A supporter of the French Revolution, he immediately renounced his title. He was imprisoned during the Terror but was released after spending nine-months in captivity. His first book on political theory, Letters of a Genevan to His Contemporaries, was published in 1802. This was followed by Introduction to the Work of Science in the 19th Century (1807), Memoir on the Science of Man (1813), On the Reorganisation of European Society (1814), and The New Christianity (1825). 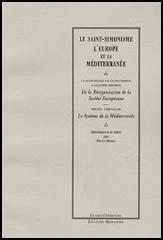 In his books Saint-Simon argued that Europe was in "critical disequilibrium" and would soon undergo reconstruction. He argued strongly for a planned economy. He suggested a framework of three chambers: one body made up of engineers and artists to propose plans, a second of scientists responsible for assessing the plans, and a third group of industrialists whose task would be that of implementing the schemes according to the interests of the whole community. After his death in 1825, Saint-Simon's ideas were developed by a group of loyal followers such as Olindes Rodriguez, Armand Bazard and Barthelemy-Prosper Enfantin. In 1830 the group published An Explanation of the Doctrine of Saint-Simon. 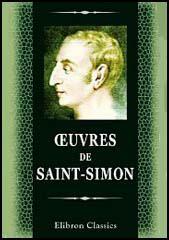 The interpreted Saint-Simon as being a socialist and argued for the redistribution of wealth for the benefit of society. Saint-Simon's theories also influenced figures such as Alexander Herzen, Thomas Carlyle and J. S. Mill.